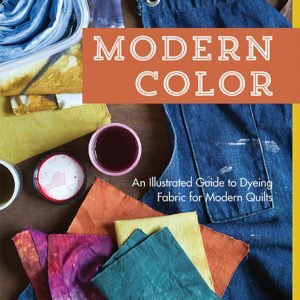 Modern Color—An Illustrated Guide to Dyeing Fabric for Modern Quilts by Kim Eichler-Messmer shows you how to dye fabric by hand for an artisanal, luminescent look. Includes instructions on setting up a home dye studio with minimal equipment and teaches key mixing techniques. Make any color you want, including any value (lightness and darkness) and gradation, allowing for an unlimited palette and endless inspiration. Go ahead, take a dip!